Fourteenth month statistics: Weight: approximately 27 lbs. 11oz. Length: 31 inches. 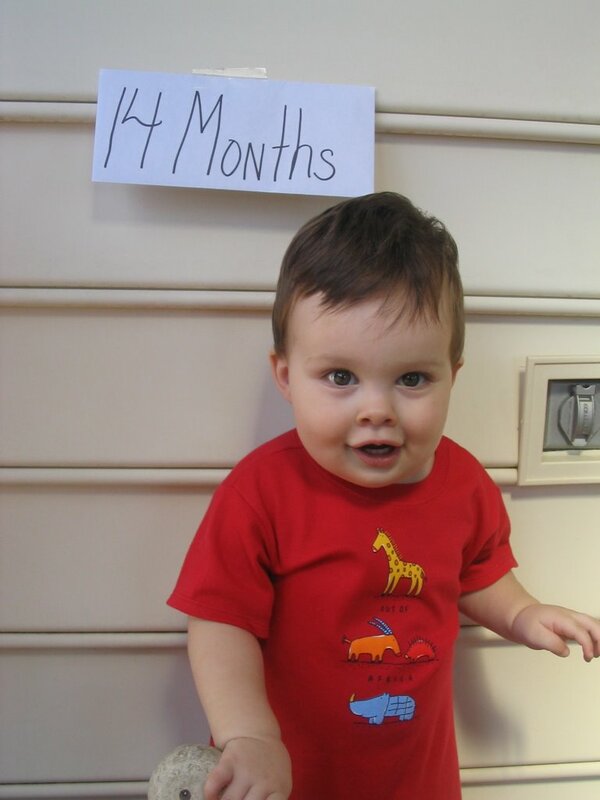 Diaper Size: 5 Clothes: 18 months and some 24 months although they are very long still. Summer has come to an end and this morning it was 52 degrees outside. I had to dig an old jacket out of the closet for you to wear. Luckily, Aunt Betsy bought you a big jacket last year and it still fit great. I have been buying your fall wardrobe and purchasing size 24 months or even a few 2T. We usually have to roll up the sleeves and the cuffs, but I’m sure they will fit fine in another few weeks. We have been so busy these past few weeks. We took our very first family vacation to the Outer Banks in August. What fun! You got your tenth tooth, a molar on the top right while we were there. You didn’t much care for the beach. The first few days were so hot and humid it was almost unbearable! At the beach, you did okay in the sand after a little while, but you were very scared of the ocean. Nanny did really well! She has so much fun sitting with you in the back seat of the car and laughing and giggling and playing with you. She now refers to you as her little peek-a-boo. You had great fun pulling your little blanket over your head and smiling at her. I am so happy that she was able to come and spend such glorious days with us. When we got home from the beach, you got a third molar to bring the total up to eleven. It was a rough couple of days while you were drooling and nose running. You even woke up during the middle of the night a few times, just crying and crying. Your dad and I would take turns going in and rocking you. Luckily, it passed quickly. Last month I wrote about your first bloody nose and this month I get to write about your first goose egg. We were all playing downstairs in the basement. You ran around the corner by the spare bedroom, when we heard a crash. You must have fallen and cracked your head on the door jam. You got this huge goose egg with a big bruise down the middle of your forehead. I’m sure it wont’ be the last, but you gave us a good scare. You are a very busy boy! Running everywhere and into everything. You love to play in your kitchen cabinet with all the Tupperware. Thankfully, we have locked all of the other cabinets. You love to pull out all of your sippy cups and pretend to drink out of them. This month we tried to give you cow’s milk for the first time. You took one sip and then threw the cup on the floor. After a week, we tried so milk. You aren’t loving it, but you will drink a few sips. At day care, Candice is now giving you one 5-oz. Bag of milk in the morning and then your sippy cup of soy milk in the afternoon. Oddly enough, you usually won’t drink the soy milk until we come to pick you up. I haven’t really figured that one out yet. Lately it seems that you love to throw things. Trying to feed you in your highchair is like a game to you sometimes. You eat well when you are hungry, but as soon as you start to get full you throw your food overboard. The dog loves it. She sits patiently by and waits for the rain of food. Speaking of food, you are eating everything. I think the only things we aren’t giving you are things like peanuts and shellfish. The other night we had shrimp for dinner so I made you a tilapia fillet. You loved it. I couldn’t believe you ate almost the entire thing. 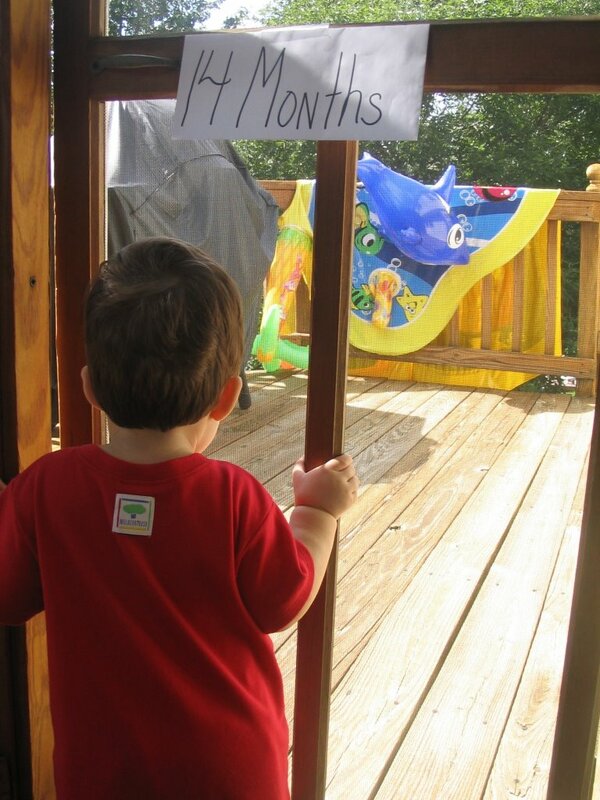 The big news of the month is your first word….. Mama! Yea! On September 17th you started saying it. Of course, you use the word for lots of things, not just me, but in any case it does seem that Mama is your first word. Anther exciting month has come and gone. We love you!